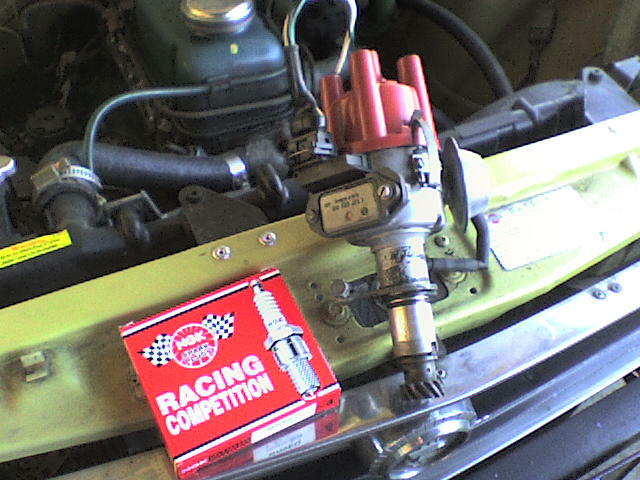 this is from a Ford Fiesta 1.1(electronic), NGK BPR9EG and also Lucas sport iignition coil 40Kv. UK Fiestas got electronic ignition starting in 1986 (Fiesta Mk II). This engine is the famous Kent design, which was even sold in USA. The Fiesta uses the Valencia fwd variation of Kent engine. Only $210 pounds at Burton. I wonder why the distributor fits the Datsun engine... must be some historical reason dating back to Austin? Eu julgava que era necessario um sistema "transistorizado" para "controlar" este sistema. Can someone tell me if we can use the datsun coil? I didn`t understand the wiring yet. Yes, you can use the Datsun coil. With the Datsun 1200 coil, be sure to use the ballast resistor too. A diesel with a distributor? Sorry, I don't understand. Which Fiesta series (approximate years) is this from? Cool mod, Is this a ford laser here? Got a engine model no.? Looks more like a Ford Festiva. Well Bam my Lamb, I work at Ford!! I'm going to have to keep a lookout for these parts now. Could this be similar to a Mazda 121 shades me wonders? Every chance, similar year, same company (almost), would have used same parts. Do you have a picture of the Fiesta? This sounds like a good conversion Lotto! what is the difrence in this setup to the sst one? We never got a 1.1 Ford/Mazda engine over here in aust. i think they started with 1.3 here. Could be the same. Well, first the car is still running, after all these years, but it was in vegetative state for at least 6 years, I've broken the engine because lean mixture......but it was an excuse for a major rebuilt. Now it's an 1300cm3 full balanced engine, but that's for a other topic. Regarding de distribution it still running with the ford part, the transformation it's easy, you have to cut the main shaft because the Ford engine uses a longer one, then you make another hole for the pin of the Datsun sprocket.....and don't need balastre, connected direct to the H voltage coil.